I recently ran across an important 2013 JAMA (Journal of the American Medical Association) article, the content of which is printed below. It is about a new form of medical propaganda, physician conflicts of interest, the cunning of Big Pharma’s advertising and how most physicians are at risk of being mis-informed and mis-educated at a time when they are being pressured to spend less and less time with their patients and to rely on the over-prescribing of Big Pharma’s synthetic chemical drugs. As I often told my patients, it only takes 2 minutes to write a prescription but it takes 20 minutes to NOT write a prescription. I have shortened and slightly modified the article, mainly for length considerations. The original is available for those who wish to read the entire article--as noted below. The article seems to have been cunningly well-hidden from us physicians and by the consumers of healthcare by the powers that be – probably because of the sensitive nature of its contents. The JAMA is one of the handful of peer-reviewed journals published by the AMA (American Medical Association). I used to receive it decades ago when I was a dues-paying member. Evan though I quit my membership probably 30 years ago, I still receive monthly letters asking me to pay my dues and start receiving the journal again. But the JAMA has, probably because of financial difficulties, changed from a well-respected medical journal that didn’t allow the pharmaceutical industry to influence what it published to one that is reliant on Big Pharma money. (The JAMA has been, for well over a hundred years, the official journal for the AMA, which is still the most influential medical industry trade group and lobbying group in the US.) But the JAMA’s hard-earned respectability all changed when it, just like the New England Journal of Medicine (note the quotes above from the fired NEJM editor, Marcia Angell, MD), began accepting excessively large amounts of advertising money from the pharmaceutical industry and then began publishing articles that had been ghost-written by Big Pharma mercenary writers or had been written by authors with serious conflicts of interest with the pharmaceutical industry. By the time the JAMA and the NEJM started losing their respectability, we physicians had already had been receiving scores of glossy, throwaway freebie medical journals every month that had already had ridiculously heavy drug advertising. The pages devoted to the highly biased and often laughable advertising commonly out-numbered the supposedly professional articles. And I have to report that the quality of the advertising in the professional journals usually never rose above what is seen on prime-time television for the uneducated consumer class. Nowadays we physicians get Big Pharma’s propaganda online, often in the form of free or reduced-cost tuition for our continuing medical education courses, courtesy of the Medical Comunication Companies (MCCs) like MedScape and WebMD. The article I have printed below exposes the under-the-table flow of money that keeps popular online MCCs full of plausible (but often misleading) information that is consistently favorable to the dis-informational agendas of Big Pharma. On those sites the multitude of iatrogenic disorders (diseases that are caused by doctors or Big Pharma’s prescription drugs) are never mentioned. As should be easily appreciated by folks that have at least some critical thinking skills, iatrogenic diseases are a serious taboo subject that Big Pharma and the medical establishment wants to keep hidden from their drug-taking patients. These MCC online sites maintain the ignorance Big Pharma desires for us too-busy prescribing physicians and our often “desperate-for-unbiased-information” patients who suspect that they are being sickened by the synthetic chemicals and vaccine ingredients that have been prescribed for them, substances that can be addictive, neurotoxic, dementia-inducing and a cause of mitochondrial toxicity (especially in the case of psych drugs). (Mitochondria, by the way, are the tiny energy-producing “hearts and lungs” of every living cell in our bodies that can be poisoned by the ingredients of many of our commonly prescribed drugs and vaccines.) The article summarized below reveals the actual names of the biggest culprits: the amoral, for-profit, multinational Big Pharma corporations that annually hand out tens of millions of dollars to their co-opted and obedient MCC recipients who are—unfortunately—mistakenly trusted by both physicians and their confused patients. What may be worse is the fact that these for-profit MCCs are responsible for providing dis-informational “content” for the thousands of health “journalists” (who are notorious for having little or no medical science background). One sees those health journalists all over the newspapers, radio, TV and internet with their ubiquitous and very plausible articles that are often directly fed to them from the MCCs and their sugar daddy, Big Pharma. The health journalists, in reading the prepared-for-immediate-re-publication content, feel that they are doing research, whereas what is actually happening is deception and indoctrination. The same thing happens on the nightly news when Big Pharma’s MCC-generated videos are shown on the TV news without the local station ever mentioning the gross conflicts of interest. This common tactic does represent “easy journalism” for our too-busy health writers who have deadlines to meet, but it should be admitted to for the sake of the media’s duped consumers, and it should be exposed and condemned. A decade ago, when medical establishment and lobbying groups like the AMA, APA, AAP, AAFP, etc warned us about getting our information from the internet, they were afraid, sometimes with justification, of the influence of the complementary/alternative medical community that was out there. Many consumers found out that what was out there was frequently useful and sometimes curative – a big threat to more than one medical establishment group. These self-help sites were often nutrition-based and often provided education and information that could make unnecessary an unaffordable physician visit that usually ended with an unaffordable prescription or two. Real cures--rather than perpetual, life-long drug or disease “management”--often could be found online. It was only later, when the establishment came to dominate the internet with their propaganda (and Google’s ranking system that always puts MedScape and WebMD on top) that I came to agree with their warnings about online medical disinformation. Only now we have to be worried about what the medical establishment is trying to convince us to do. The article below explains one reason why those fears are well-grounded. Remember the truism: “Whoever pays the piper, calls the tune”. It has never been more true than at this time of astronomical health care and bankrupting prescription drug costs. __________________________________________________________________________ JAMA. 2013;310(23):2554-2558. doi:10.1001/jama.2013.281638 Medical Communication Companies and Pharmaceutical Industry Grants By Sheila M. Rothman, PhD; Karen F. Brudney, MD; Whitney Adair, BA; David J. Rothman, PhD http://www.imapny.org/wp-content/themes/imapny/File%20Library/JAMA/JAMA-Medical-Communication-Companies---jbr130003.pdf Medical communication companies (MCCs) are among the most significant but least analyzed health care stakeholders. Supported mainly by drug and device companies, they are vendors of information to physicians and consumers and sources of information for industry. Known best for arranging continuing medical education (CME) programs, they also develop prelaunch and branding campaigns and produce digital and print publications. The MCCs’ relationships to industry and to physicians are not easily investigated. Industry contracts with MCCs are not publicly available and until recently neither were industry grant awards. Neither donors nor recipients made the data available. Then in 2010, 13 pharmaceutical companies and 1 medical device company posted grant registries on their websites. Some appeared as the result of legal settlements with the Department of Justice; others were posted voluntarily. The disclosures went beyond the stipulations of the Sunshine Act, which mandates reports of payments only to physicians and teaching hospitals. These registries include the names of all health care organizations, including the names of the MCCs that received at least 1 grant, the grant’s purpose, and the award’s precise dollar amount. The purpose of this study was to explore the financial relationships between MCCs and drug device companies, to describe the characteristics of large MCCs, and to explore whether they accurately represent themselves to physicians. Methods Our database included the 2010 grant registries of 13 pharmaceutical and 1 device company. When we began data collection in the summer of 2011, these were the only companies that had reported complete 2010 data for all divisions. We sorted recipients into organizational categories and totaled the funding they received. We then explored the relationship between MCCs and the drug and device industry. 11 of the drug companies ranked among the top 20 in the field by annual sales. The remaining 2 ranked in the top 30. We combined information from quarterly reports and grant registries…to create a master list of 19,272 grants totaling $657,643,322 awarded to 6,493 recipients. We grouped recipients into 7 categories, consulting master lists and self-definitions: 1) MCCs, academic medical centers and affiliated hospitals; 2) hospital systems and independent providers; 3) professional medical associations; 4) professional associations organized by nurses, health administrators, and scientists; 5) disease-targeted advocacy organizations established by laymen for patient education and advocacy; and 6) research organizations such as the NIH (National Institutes of Health). Category #7 included community, faith-based, and non–health-specific organizations. …A grant was assigned to the MCC category when an organization’s website defined its primary mission as the dissemination of information on disease states, prevention, management, therapies, and drugs or medical devices and was not a subsidiary of other recipient organizations (such as an academic medical center). 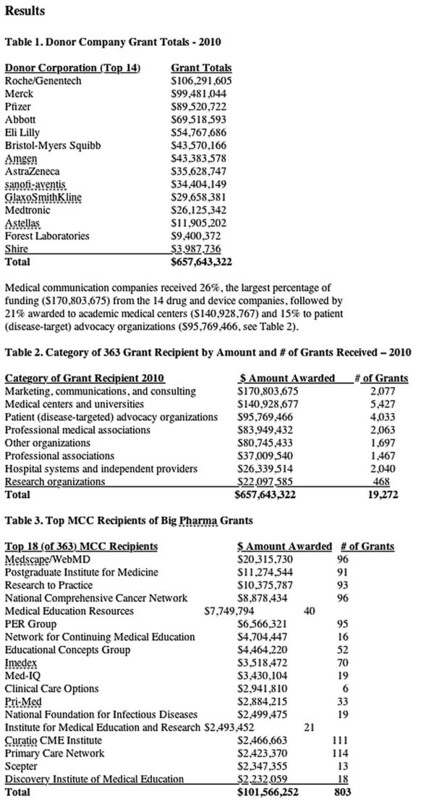 By these criteria, 363 grant recipients were identified as MCCs…. We selected the top 5% of recipients (18) for in-depth analyses. These recipients received 58% of MCC industry funding and 30% of MCC industry grants. Because such a small group received such a large proportion of the funds and grants, we decided to focus on them….We devoted particular attention to CME because most registry grants were specified for “educational activities.” 14 provided CME courses at “live events” such as at medical conferences and grand rounds. 17 offered online CME courses, including webcasts, podcasts, interviews, case-based discussions, slide sets, journal articles, and interactive games…. Importance Medical communication companies (MCCs) are among the most significant health care stakeholders, supported mainly by drug and device companies. How MCCs share or protect physicians’ personal data requires greater transparency. Objective To explore the financial relationships between MCCs and drug and device companies, to describe the characteristics of the large MCCs, and to explore whether they accurately represent themselves to physicians. Design We combined data from the 2010 grant registries of 14 pharmaceutical and device companies; grouped recipients into categories such as MCCs, academic medical centers, disease-targeted advocacy organizations, and professional associations; and created a master list of 19,272 grants.